67 S T A R T H E R E 2 0 1 8 that allow for immediate printing and laminating, Jen says. "It's all about preference," she says. Sumner recommends a wide-format, 60-inch printer for better printing on the wrap panels, since wraps cannot be installed in a solid piece. The printer prints the graphic images onto the panels, and the wide format keeps the panels seam- less, he says. "When you print a graphic, you're lim- ited to the width of material. You need to panel it and line it up like a puzzle," Steve says. 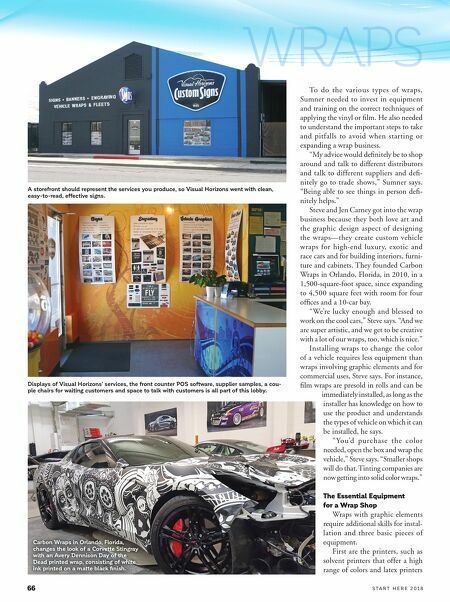 The wide format also is ideal for lami- nators, which laminate the wrap panels and protect and increase the longevity of the graphic images by adding a clear coat, Sumner says. "The lamination is the final step in the proper production of graphics," he says. The other piece of needed equipment is the plotter, or vinyl cutter, which is used for die cuts of printed and cutout letters and graphic images, Sumner says. Sumner says to expect to spend $25,000 to $60,000 on a printer, $8,000 to $10,000 on a laminator and $7,000 to $15,000 on a plotter, though prices can range. For his business, Sumner started with a combined printer and plotter but soon saw a slowdown in production time, so he recommends separate pieces of equip- ment for the two steps of the process. He recommends against purchasing the least expensive equipment, which results in more frequent replacements, and making purchases with growth in mind to handle a larger scale of jobs but not going with the largest and most expensive options. "Don't buy the best of the best," Sumner says. "You have to make sure you have the work first." Buying equipment with additional features can expand their capabilities and save time but also will carry an added cost, Sumner says. Some examples include a take-up roll on the printer or laminator to wind up the film rolls and save on shop space, as well as color spectrometers to build custom color profiles, but the profiles from manufacturers will be enough to get started, he says. Can you quote 75 4x4 signs, email the quote to your customer, have the signed quote back in hand with a deposit and put the job into production – all within 30 minutes? Pricing your work properly, and profitably, is one of the most challenging parts of the sign and graphics business. Download a free trial today and get a leg up with EstiMate! www.EstiMateSoftware.com It's Not Luck. 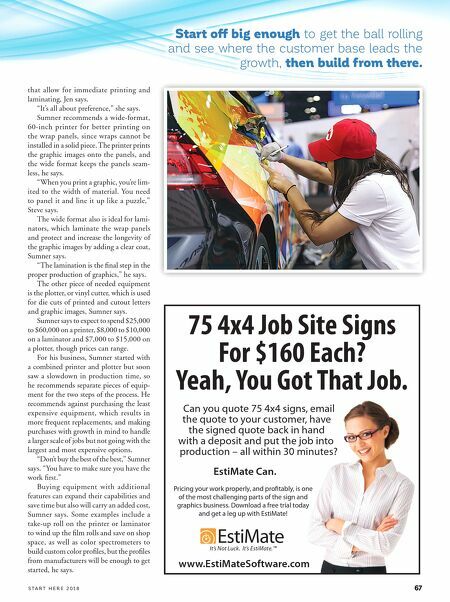 It's EstiMate.™ 75 4x4 Job Site Signs For $160 Each? Yeah, You Got That Job. EstiMate Can. EstiMate Start off big enough to get the ball rolling and see where the customer base leads the growth, then build from there.